Firstly, I would like to mention the band's new look website which the was relaunched on Feb 3rd 2017. I have to say that it is visually stunning, and I am very impressed with the 3D starscape animation and vector grid graphics on the home page, as well as the modern, minimalist layout, the new fonts and redesigned metallic logo. The site is easy to navigate, too, which is always welcome - good work, guys. On the site you will find a selection of videos featuring covers of well-known 80s hits. The quality of this band is exceptional, and having watched all of the videos, I would feel very confident in booking these guys for a special occasion. Also on the website is a gallery of photos, info about the band members and a list of upcoming shows, as well as the essential contact details. I was particularly impressed with the posters section which features eye-catching flyers advertising past and forthcoming shows. Each poster includes artwork from well-known 80s films - a nice touch. You may (or may not!) remember that I reviewed this excellent 80s tribute band back in 2015, which you can read here. 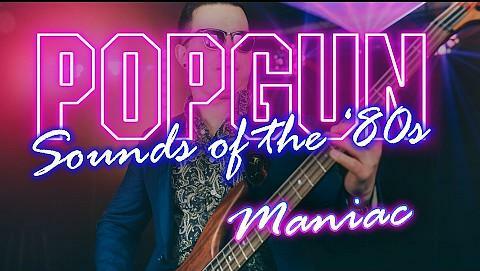 I would like to do a review of Popgun's latest video, which is a cover of Michael Sembello's classic hit "Maniac". The track featured in the movie Flashdance, which helped to fuel an 80s fitness craze back in the day. The song was a chart-topper in both the U.S. and Canada. The original has a particularly strong electronic percussion section, and Popgun have not only faithfully reproduced this, but they also have the added benefit of their real drummer (Simon Lipscombe) which gives a beefier sound and makes for a much better live performance, of course. Lead singer Phil Maher sounds remarkably similar to Sembello, although, if anything, has a stronger voice. Indeed, I had to double check that I wasn't playing the original video! There's a very impressive guitar solo by Matt Young around three minutes in, and it sounds remarkably similar to the original - great work, Matt! I like the fact that Popgun have created an authentic, tight sound with a top notch arrangement, and it still sounds very 80s, thankfully. The last thing you need at a wedding (or any event for that matter) is a cover band that messes around with a classic tune to the point where they sound nothing like the original artist. Thankfully, Popgun manage to slightly enhance the sound without destroying it. The only thing missing here is Jennifer Beals in her tight, black leotard, but you can't have everything, I guess! If you want to impress your guests, then book these guys for your event - only a maniac wouldn't!